This 4.5-hour course delivers a clear and efficient overview of palliative care, how it’s delivered across a variety of settings, and how to identify patients who need it. You’ll explore the evidence base for palliative care, identify common trajectories of serious illness, discover new tools for supporting patients with chronic or serious illness, and utilize case studies and interactive exercises to build and strengthen your prognostication skills. This is the first course in a nine-part series, Primary Palliative Care Skills for Physicians, NPs and PAs. Take each course individually or enroll in the full series for a significant discount! Learn more about the full series here! As our population ages, more of your patients will be diagnosed with serious or chronic disease. 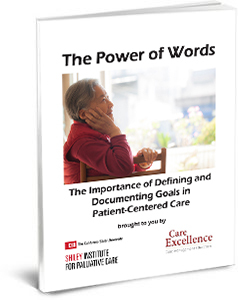 This curriculum will help you improve care for those patients by providing simple and effective strategies that allow you to weave palliative care principles into your busy primary care practice. The Doctors Company designates this activity for a maximum of 4.5 AMA PRA Category 2 Credit(s)™. Physicians should claim only the credit commensurate with the extent of their participation in the activity.